You’ve never felt a lotion like this before. 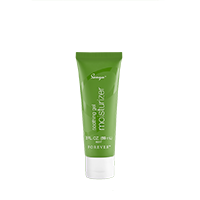 Soothing gel moisturizer looks like a lotion, but this gel based formula melts into your skin. Over 10 natural plant extracts and oils, including jojoba esters and olive oil, help skin feel hydrated and supple. Beta-glucan extracted from mushrooms has been added to this unique formula to soothe the skin and even skin tone. We also added anti-aging ingredients like linoleic acid and hydrolyzed collagen, scientifically advanced to go into the skin where its needed most and phytic acid, a powerful support for combination skin, to improve the look of your complexion. To finish the formula, we infused it with orange peel oil, mandarin orange peel oil, roman chamomile flower oil, geranium flower oil and bergamot fruit oil to leave skin feeling refreshed, making this your new favorite all-around daily moisturizer. Gently massage into skin on face and neck twice a day in the morning and evening, except when using the refining gel mask, Use it as part of the Sonya™ daily skincare system for optimal results.